If your curb is looking a little worse for the wear, consider repair as part of your commercial landscape rejuvenation project this spring. The spring is a perfect time to refresh your commercial landscape. After the harsh winter cold, you can begin to address some issues in your landscape that are lacking. Safety, sustainability, and aesthetics are all great reasons to rejuvenate your outdoor commercial landscape. Take a moment to consider what your property may need. Here are four things you can do to rejuvenate your commercial landscape this spring. If it has been a while since you’ve updated or installed your current signage, now may be a great time to take a look at it. Weather and the elements take their toll on signs and standards in style evolve over time as well. Signage ought to be a fundamental part of your commercial landscape that guide your customers, guests, and clients to your business. It should be clear and easy to read both day and night. Take a look at your current signage and determine whether now might be the best time to update it. Outdoor seating is a great way to boost employee morale by giving them a place to bask in the sun during breaks. This could be a great new project for everything from commercial office buildings to retail establishments. Great commercial landscaping requires constant attention and care. Mature plants oftentimes outgrow their spaces and the aesthetic this produces doesn’t reflect well on your business. In some cases, the best plan of action is replacing these old plants with new ones, especially if the current cost to care for and maintain your existing plants just isn’t worth it. This also gives you an opportunity to rejuvenate your commercial property with a fresh new look! Check out the surfaces around your property. Are any curbs uneven? 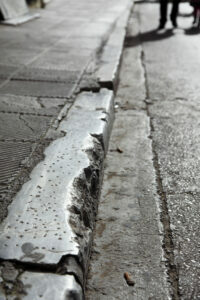 Does your parking lot need repaired or repaved entirely? Weather, especially winter weather, can take its toll on any paved surface, and you should keep the safety of your guests in mind by having any damage to these surfaces repaired. Also, take a look at your outdoor lighting. This is another critical part of keeping your guests safe at night and can also attract more guests to your property. If your lighting is deficient in any way, that should be a priority in your commercial landscape rejuvenation efforts this spring. This entry was posted on Thursday, March 9th, 2017	at 9:49 pm	and is filed under Landscaping Maintenance	. You can follow any responses to this entry through the RSS 2.0	feed. Both comments and pings are currently closed.